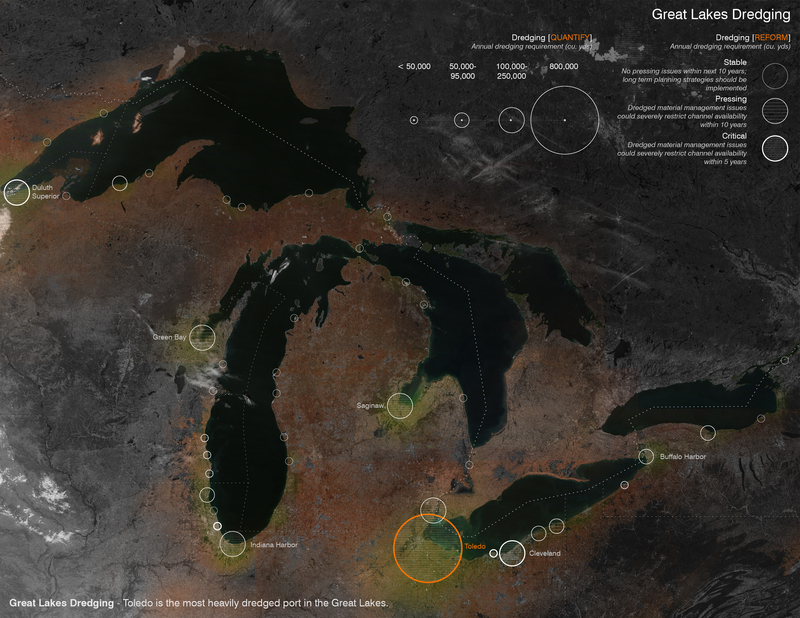 Toledo is the most heavily dredged port in the Great Lakes. Site Proposal. A raised circulation system embraces a contained dredge production facility. 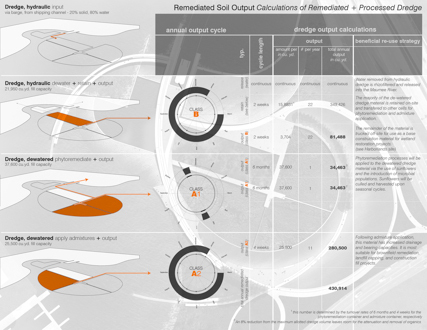 Calculations of remediated and processed dredge. 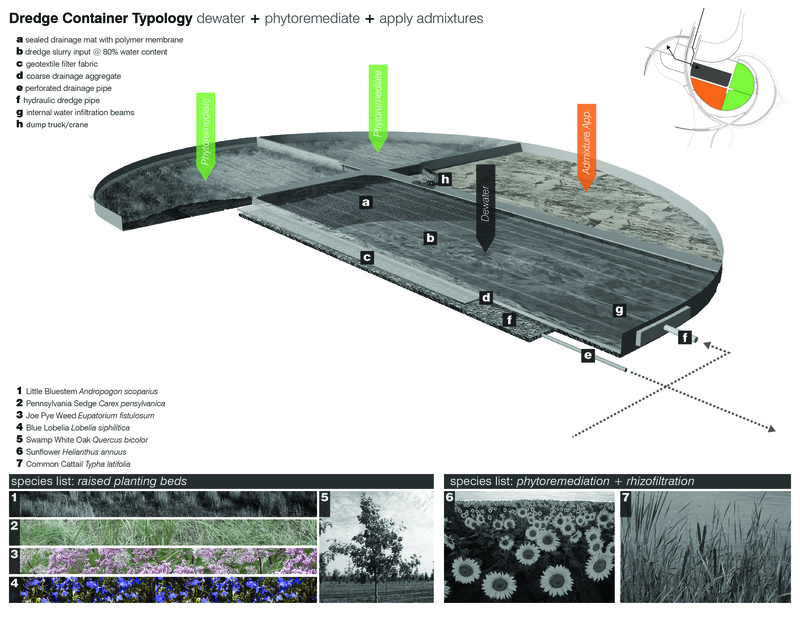 Dewater, phytoremediate, and apply admixtures. 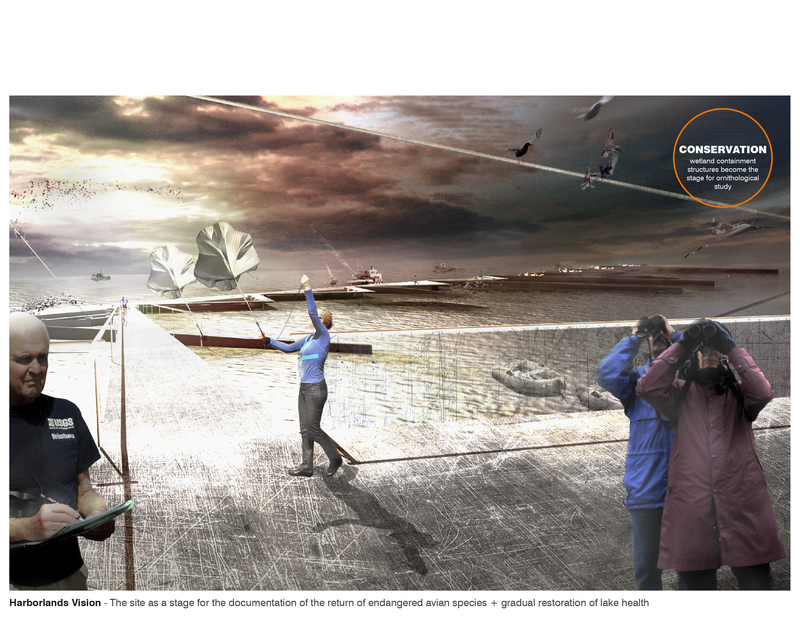 Dredge remediation and processing as theatre. 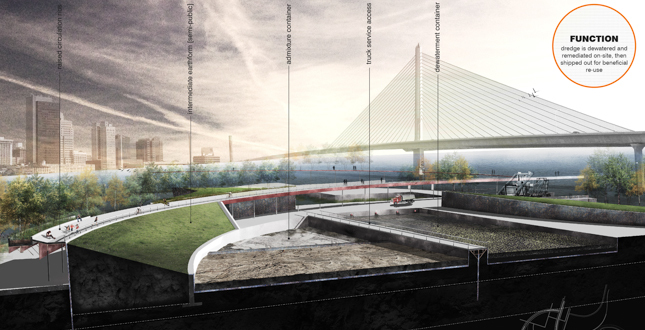 Pedestrian oriented raised concrete ribs offer views of the skyline and the depressed performance space. A series of linear wetlands are created seven miles from the nearest shore of Lake Erie’s western basin. Proposed wetland type, size, and orientation are a result of a suitability analysis of highest priority stopover sites for waterfowl and shorebirds. 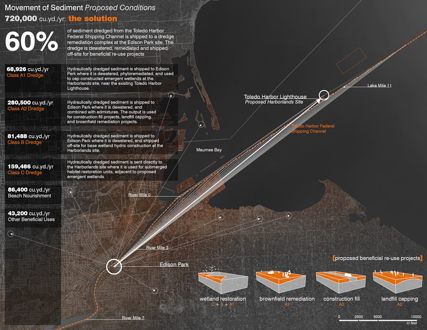 Various classes of processed sediment are distributed through the Harborlands site. 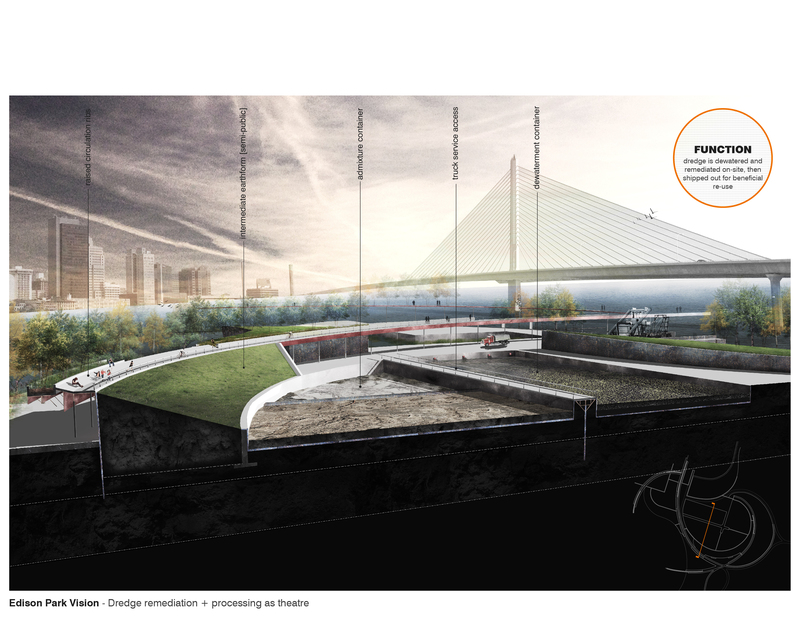 The site as a stage for public events and the gradual return of the Toledo resident’s relationship with the lake. The site as a stage for the documentation of the return of endangered avian species and gradual restoration of lake health. Dredge City: sediment catalysis deploys the idea of catalysis – the process of accelerating a chemical change – at the landscape scale as a design strategy to aid Lake Erie’s failing health. The condition of Lake Erie has significantly decreased over the past century; it has lost 50% of its coastal wetlands and annual algae blooms have become commonplace. 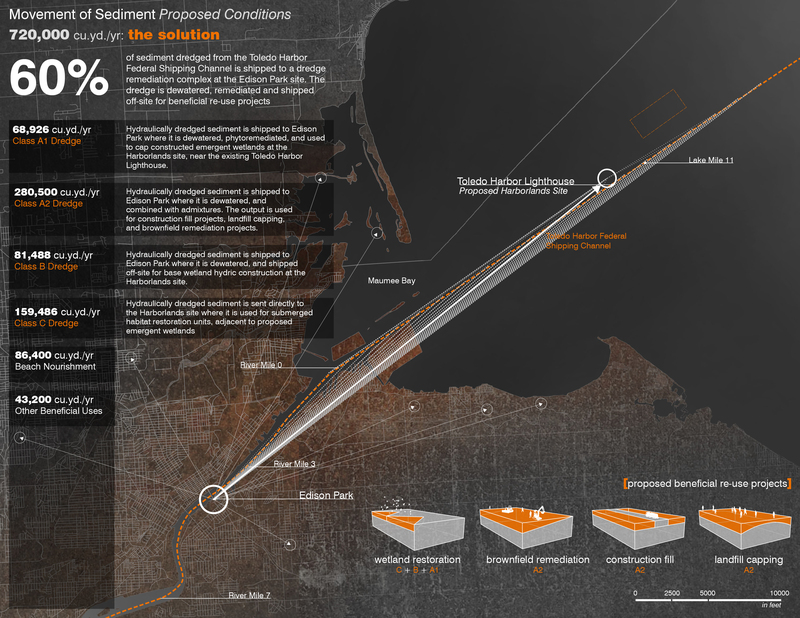 Sediment dredged from the shipping channels of this region has significant potential as a catalyst for the revitalization of the lake. Dredge City: sediment catalysis introduces a system that re-structures the dredge management system to leverage it as continual, fluctuating resource. 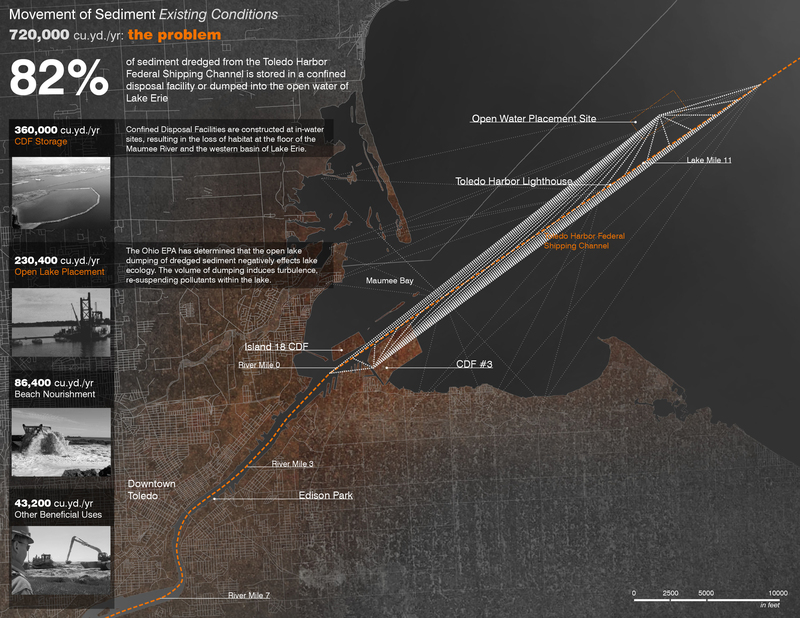 For the project, sediment is hydraulically dredged from the shipping channel and transported to Edison Park via barge. 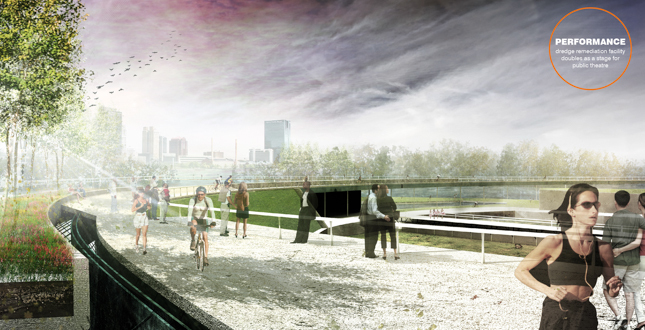 Edison Park is a riverside brownfield site, located about four miles from the mouth of the Maumee River. Here, dredge is pumped into the site (at about 20% solid, 80% water), entering the first of five cells. Water is extracted from this initial material, entering a separate water containment cell. Here, the extracted water enters a rhizofiltration process and is released back into the Maumee River. A portion of the remaining de-watered sediment is shipped off-site as Class B soil. This material is of an intermediate quality and is best applied as a base for wetland restoration. The remainder of this de-watered sediment is transferred to one of two additional cells. The first consistently accepts de-watered dredge, where a process of phytoremediation is applied. The product, a highly refined material, Class A1 soil, is valuable as a capping material for wetland remediation. The final beneficiary of de-watered dredge is a container reserved for the application of admixtures to the sediment, increasing its drainage and bearing capacities. The product of this cell, Class A2 dredge, is most suitable for projects conducted by the Toledo Department of Transportation such as brownfield remediation, landfill capping, and construction fill projects. At the Edison Park site, a dialectic social agenda is apparent. 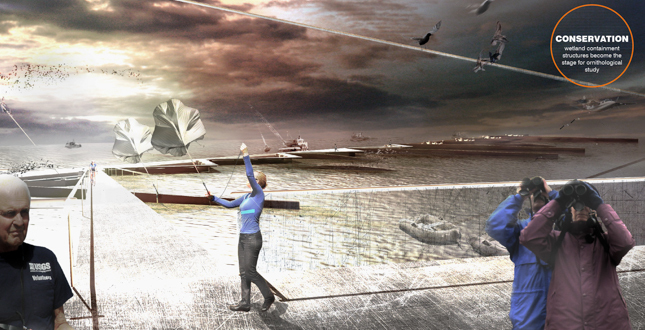 The ephemeral form and malleability of dredge become a passive theatre for the site user. 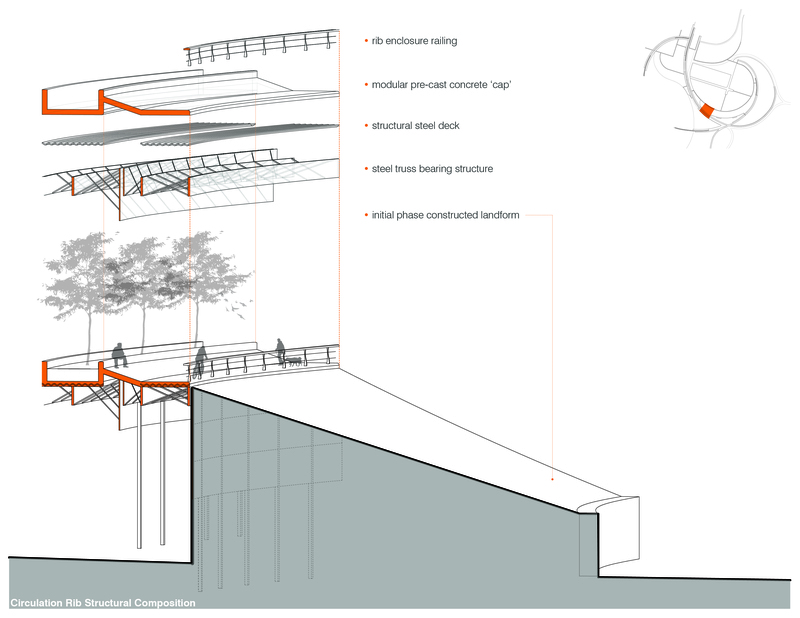 A raised circulation system elevates the site user 15-20 feet above the areas of research and production. Elevated planters alleviate erosion from stormwater run-off and provide shade for those using the site recreationally. 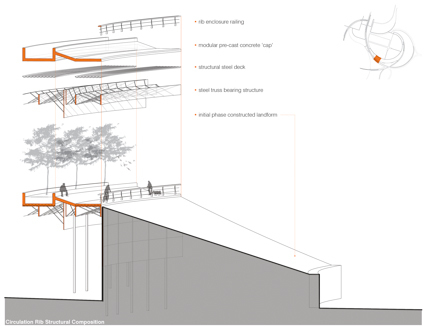 Raised earth forms act as intermediate structures, separating the public from the private. 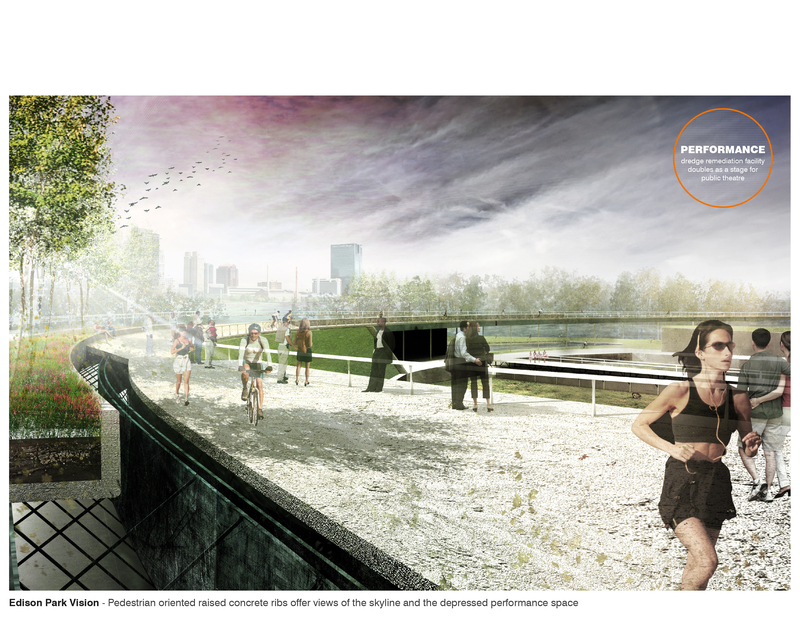 The depressed production facility may also double as a stage for public performance during certain parts of the year. One of the primary beneficiaries of the material from Edison Park is the Harborlands site. 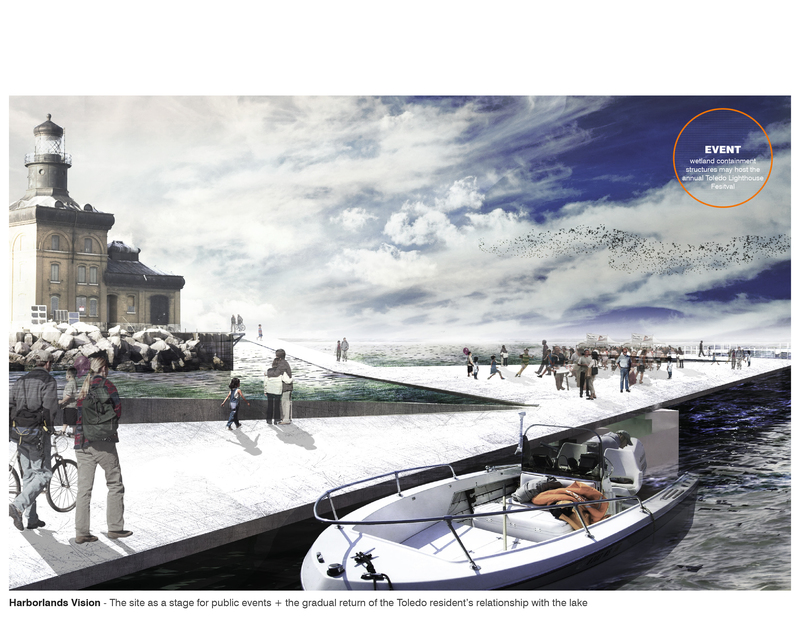 The Harborlands is a proposed series of constructed wetlands as stopover sites for waterfowl and shorebirds. 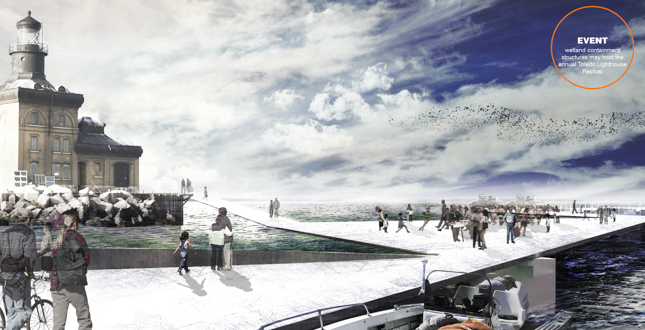 The avian species of the highest travel volume and highest risk of endangerment were selected as determinants of the location of the Harborlands site. The volume of such species was determined through their flight patterns between existing priority coastal wetland sites. Localized regional avian migration routes between existing stopover sites define wetland typologies and orientation. 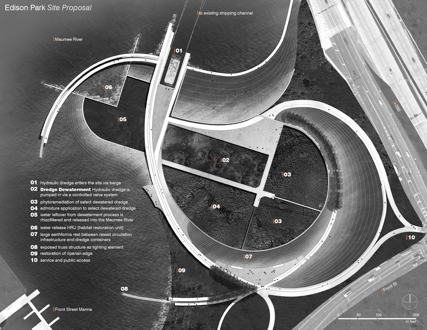 For ease of access, the series of wetlands are proposed along the existing shipping channel where they intersect these primary migration routes, beginning at the site of the historic Toledo Harbor Lighthouse. 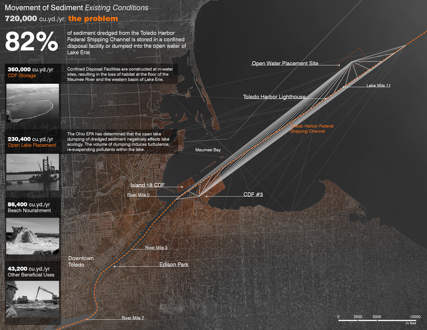 The consistent input of remediated dredge material from Edison Park defines site access points such as dredge dumping nodes. Each class of dredge performs a unique function in the construction of wetlands, based upon the extent to which it has been remediated or processed. The highest quality dredge is used to cap emergent wetlands, providing the highest suitability nesting and breeding sites for shorebirds and waterfowl. 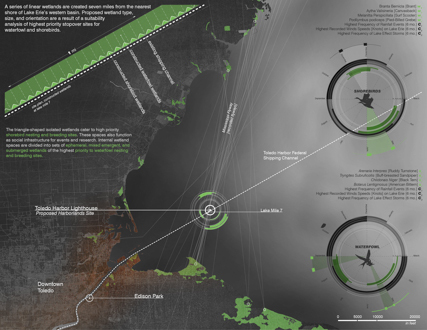 Two variables – dredge and avian migration- define the form and program of the Harborlands site. A stage for the increase of social awareness of wetland restoration has been set. Visitors to the Harborlands site will watch the re-introduction of endangered and distant migratory birds to the western basin of Lake Erie as it unfolds. Site users of all varieties to the Harborlands site will be inspired to return to their communities and pursue further ecological conservation projects. A dialect between city and lake, society and ecology, has been instilled, catalyzed by the unique flux of dredge material. Toledo is a city of dredge; an invisible, assumed-ubiquitous material. At the core of its existence, the city has turned its back on the very process that keeps it alive – dredging. 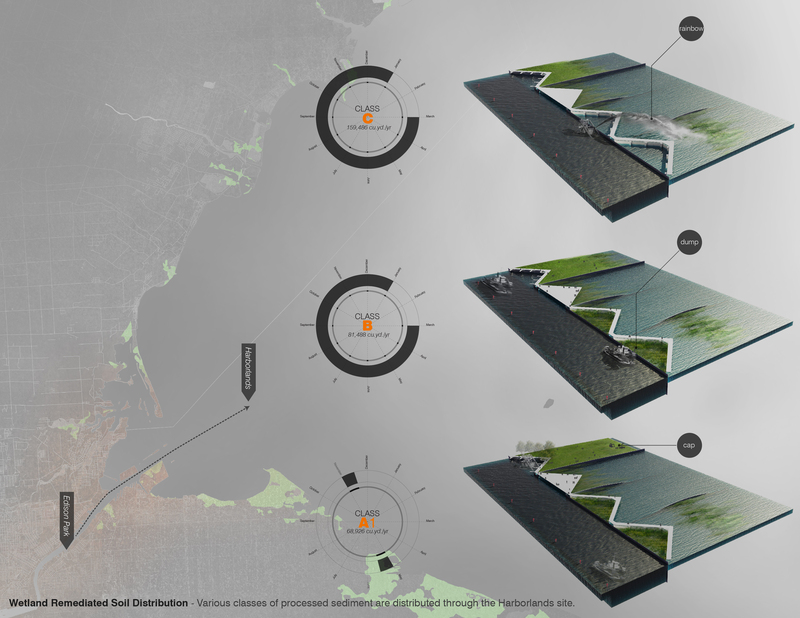 Dredge City: sediment catalysis looks to propagate a new understanding of this process and the sediment it produces by using the material itself to create new landscapes of water/land interface. This will provide a re-alignment of Toledo resident’s relationship with the lake and its management and an understanding of the real Toledo- Dredge City.